Born on 29 June 1898 in Fordwich, Ontario - son of Louis Armstrong, Gormley, Ontario - attestation form notes trade as farmer, single, not now nor previously a member of the military, height of 5 feet 4 inches, chest of 33.5 inches, fair complexion, blue eyes, brown hair, Baptist. 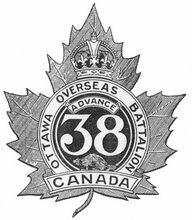 Joined the 91st Canadian Infantry Battalion on 26 November 1915 (number 189478) - taken on the strength of the 38th Battalion in France on 20 or 21 August 1916 - wounded on 18 or 19 November 1916 - rejoined the battalion on 11 November 1917 - wounded on 16 or 17 March 1918 - invalided to England on 26 March 1918. Awarded the Military Medal - unofficial citation: "For conspicuous gallantry and devotion to duty during an enemy raid of 16th March 1918. While the raid was in progress Pte Armstrong was wounded in seven places. He was a member of a bombing post and had thrown several bombs when a shell burst close by wounding him. Although nadly [sic] wounded he continued to hand out bombs to his comrades and refused to go out of the line until the raiders were repulsed. It is considered that Pte Armstrong by his gallant conduct and the cheerful manner in which he bore his wounds, and assisted his comrades is entirely worthy of an immediate award." (awarded by Corps Order 26 March 1918; announced by London Gazette, 25 April 1918." - unit recommendation from 19 March 1918: "During enemy raid Mar. 16/18 this man displayed exceptional pluck and devotion to duty. After having his right arm broken and six other wounds, he continued to hand up bombs to those who were able to throw them."